Soldier embraces his canine companion. Source: Pexels. Armed forces protect and serve all around the world - but these regiments aren’t just made up of human soldiers. Today, we want to celebrate and memorialise the achievements earned and the sacrifices made by our heroic canine troops. Military dogs served during both world wars, but were not recognised for their bravery until after the Second World War. Today, these dogs are bred predominantly in Germany and the Netherlands, and trained from birth to have the social and physical skills needed to help save lives. The 1st Military Working Dog Regiment claims that there are a maximum of 384 Military working dogs, all undertaking one of ten invaluable positions, from drugs detection to infantry patrol. The bond between a dog and their handler is undeniable: more than 90% of handlers adopt their service dog once they’ve been retired from service. These dogs, just like humans, have been known to mourn their handler’s death and are prone to suffering Post Traumatic Stress Disorder (PTSD). Making sure that these dogs go to a loving home with lots of toys and tasty treats should be a priority once their military years are behind them. Military dogs do an amazing job, if historically unrecognised, at protecting the soldiers who go out to serve their country. Read on to find out more about six particularly amazing hero dogs. 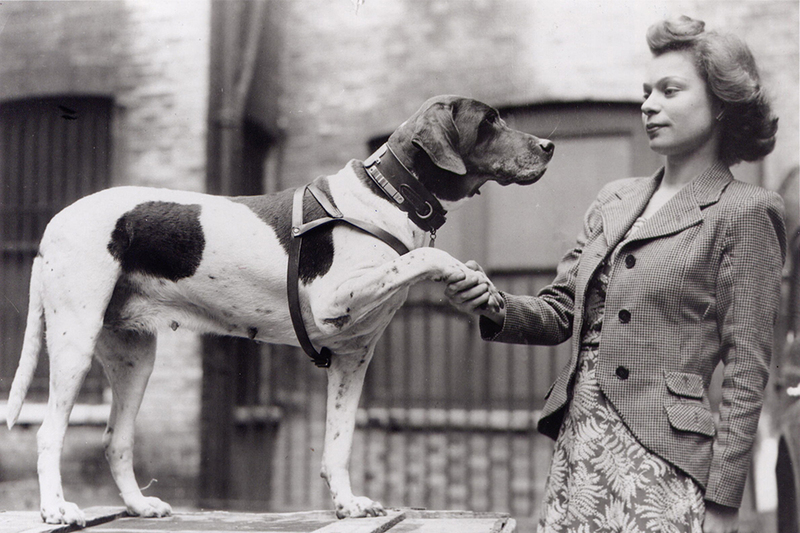 A dog with a remarkable story, Judy was a mascot for a Royal Navy ship stationed in Shanghai during the Second World War. She was an undeniable asset to the sailors, using her keen sense of hearing to alert them to incoming pirates or hostile aircraft. When the ship was wrecked, Judy helped the sailors by finding them driftwood to stay afloat and succeeding in her search for fresh water. Unfortunately, the shipmen escaped the wreck only to enter a Prisoner of War camp – this is where she met Leading Aircraftman Frank Williams, also imprisoned. He noticed that Judy was alone and hungry, and decided to give her his full rations. From then on, the two were inseparable. Judy was adored by all the prisoners at the camp. Not only would her presence cheer up the men but she was a fighter, always trying to distract the guards from handing out punishments and often taking them herself. When Aircraftman Williams left for the US after the end of the war, Judy went back with him and never left his side. Judy, Prisoner of War. Source: Gov. Buster, the famous English cocker spaniel, was awarded the honour of becoming the first official lifetime mascot of the RAF police. He served five tours in the military, sniffing out hidden Improvised Explosive Devices (IEDs) and other bombs – more than any other working military dog. One on occasion, Buster even made patrols aware of two explosive vests, preventing two suicide bombers from killing hundreds of people. Over his years of dedicated service, Buster is known for having saved thousands of military and civilian lives. Buster’s friendly personality also helped patrols engage with the community, entertaining crowds of people who came up to see him. He always had a long line of children following him when visiting local villages. Buster retired to live with his handler Flight Sergeant Will Barrow and his family, proving him to be an inspiring pup for canines and humans alike. Buster searches car for explosives in warzone. Source: BBC. This tiny dog paved the way for other military working dogs, by becoming an undisputed World War 1 hero. Stubby was found and named by Private J. Robert Conroy when combat training at Yale University. The pup was incredibly clever, able to learn the bugle calls and drills, as well as complete a little dog salute to the division’s commander. Stubby was so popular with the troops that he was allowed to remain during training, and Private Conroy smuggled Stubby with him when he left for France. After suffering from a gas attack, Stubby’s nose became ultra-sensitive to even the smallest amount of toxicity. From then on, he proved to be invaluable as he would wake up the troops and badger them into putting on their gas masks whenever he noticed early signs of gas, saving countless lives. Stubby also had the uncanny ability to differentiate between English and other languages, which he proved when he noticed a soldier sneakily mapping out the Allied trenches. When the soldier called out to him in German, Stubby attacked. He chased the soldier until he was able to bite his legs and then apprehended him until others arrived. This earned him the prestigious rank of Sergeant, the first dog to ever receive this promotion. Stubby became a canine celebrity from then on, meeting three presidents and even visiting the White House twice. Sergeant Stubby in military dress. Source: Wikipedia Commons. Toby and his handler Army Specialist Thomas J. Jackson undertook perilous tours in some of the most dangerous parts of Afghanistan to search for hidden IEDs. As a Specialised Search Dog, it was Toby’s especially-sensitive nose that would warn soldiers that danger was near. On hundreds of patrols, Toby found multiple IEDs and rocket propelled grenades, as well as an old undetonated 250 lb. Russian Guided Bomb Unit that would have killed dozens had it continued to go unnoticed. Toby’s most miraculous feat was his refusal to enter a Taliban house, despite being ordered to investigate – he also prevented any other soldiers from pushing past him, sitting firmly at the door. When the patrol called in the bomb squad, they discovered that the house had been rigged to explode. After continuing to act as a search dog in the US, Toby retired peacefully with his Army Specialist Jackson. Toby with handler Army Specialist Thomas J. Jackson. Source: Coed. This tough little terrier was adopted by Corporal Bill Wynne when he was stationed in New Guinea during the Second World War. The two were inseparable, though Smoky hadn’t been brought on as a working dog. But Smoky proved how invaluable she was to the team on one particular mission. When in the Philippines, Corporal Wynne’s team was asked to set up underground telephone lines between the military base and three squadrons, as communication was becoming exceedingly (and dangerously) difficult. However, commanders were concerned that this would take critical days and put soldiers at risk of being exposed to artillery fire. Smoky saved the day when Corporal Wynne successfully coaxed her through an underground pipe with a string tied to her collar, which would then allow the team to thread through the wires. But it wasn’t just Smoky’s small stature that helped the soldiers – she also had a big heart. Smoky is widely regarded as being one of the first therapy dogs. When Corporal Wynne was in hospital, nurses noticed the calming effect she had on the other patients, and took her with them on their rounds, where she also performed cute tricks. The two were invited to continue this show whenever they were near a military hospital. Smoky posing in helmet. Source: Wikipedia Commons. German Shepherd Lucca served on three tours with the US military, undertaking more than 400 separate missions over six years. She was a playful pup who loved interacting with other soldiers, in particular her handler Corporal Juan M. Rodriguez. But when working, she was incredibly dedicated and found countless explosive devices using her sensitive nose, saving thousands of casualties. Thanks to Lucca, nobody was killed on any of her patrols. On her last patrol, however, Lucca discovered a 13.6kg IED and, when still investigating, another nearby explosive detonated, causing terrible damage to her front leg. Corporal Rodriguez was able to rescue her and make sure that she received immediate medical attention. While she unfortunately lost her leg, she has never let that hold her back. Lucca was awarded the PDSA Dickin Medal in honour of her service. She now lives peacefully with her handler and his family, as playful as ever. Lucca with handler Corporal Juan M. Rodriguez. Source: Wikipedia Commons. Dogs are amazing, affectionate and intelligent animals with incredible protective instincts. Once you’ve taken a dog into your home, they’ll be a loyal friend for life. Make sure that they’re living life to the fullest with a nutritious hypoallergenic meal or Grain-Free meal and the occasional yummy treat, on top of all the love and affection you can extend to the newest four-legged addition to your family. Thousands of military dogs around the world risk their lives to help keep us safe every day. They are a valued part of the armed forces that should be honoured and celebrated for their service. Dogs can be heroes too, so honour them alongside their human colleagues this Remembrance Day.